STAR TREK At 50: The Man Trap | Warped Factor - Words in the Key of Geek. In his book "Star Trek Memories," William Shatner said that out of the first few Star Trek episodes filmed he felt that NBC chose the worst one to kick off the series. I don't think that's entirely true. As great as it is, to have begun with The Naked Time would've been suicidal. It's an episode where we need to have at least met the characters and understood their roles a little before viewing (and I'd argue that airing The Naked Now as episode 2 of Star Trek: The Next Generation was a massive mistake, for the same reasons). Yes, episodes like Where No Man Has Gone Before and The Enemy Within are superior, but I understand the network wanting a 'bug-eyed monster' to launch their new science fiction series, a decision made to lure in an audience. Plus, unlike later Trek series', it's not like the Original Series had any significant narrative continuity between episodes. 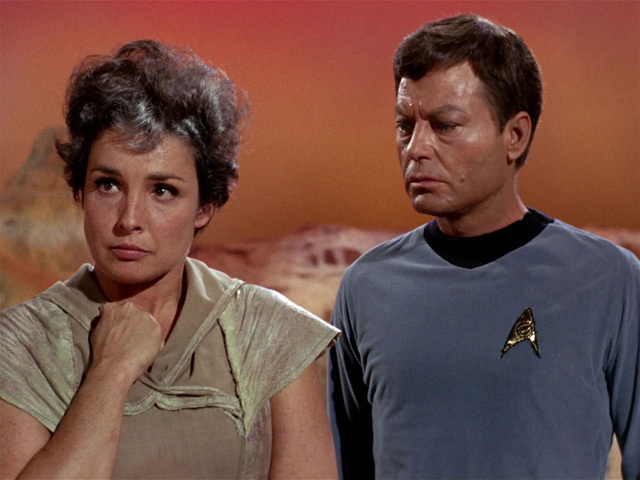 NBC decided upon airing the sixth episode filmed, which meant that in The Man Trap the actors have gelled well, creating a pretty solid, entertaining 50 minutes of television, and a great example of what it is that really makes Star Trek so much fun to watch - the interaction between the characters. It might be a 'monster of the week' episode, but even though the creature is responsible for a number of crew deaths, by the end of the story it's more to be pitied than reviled. The Man Trap takes place on a deserted planet where a scientist (Alfred Ryder) and his wife (Jeanne Bal) are studying the remains of an ancient society. The starship USS Enterprise is orbiting around the planet so that Captain Kirk (William Shatner) can deliver new food supplies, and so the ship's physician, Dr. Leonard "Bones" McCoy (DeForest Kelley), can check on their medical condition. This proves to be a bit awkward, since he and the woman were romantically involved once. As it turns out though, she's not exactly how he remembers her. After several Enterprise crew members are found dead, the cause is attributed to salt deprivation, and the strange marks on their necks suggest someone or something is doing this deliberately. 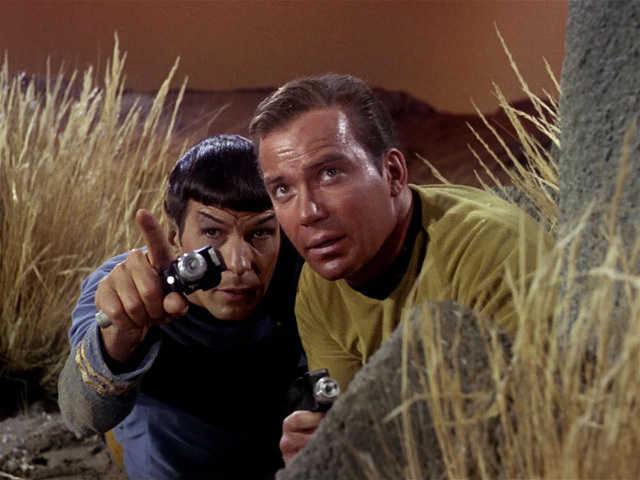 Now it's up to Kirk, McCoy and Mr. Spock (Leonard Nimoy), to find out what's going on and how to stop it. As is the case with most Star Trek episodes, the plot is quite simple: new planet, weird event, people in danger, Kirk and Co. save the day. Bish bosh. But again, this works in its favour as an opening episode. NBC had previously rejected the original pilot, The Cage, because they considered it "too cerebral". The Man Trap is exactly what it looks like: a very basic script which allows any viewer to access the classic Star Trek universe without worrying about any complicated, underlying 'mythology'. There's one more very important reason why I think this episode was the right choice to launch the show: the interplay amongst the crew, especially the central trio of Kirk, Spock and Bones. Of course it's present throughout the entire series, but being that the actors had been working together for a few months already, it's almost perfected here. And how could the show fail when the icon of the series is so entertaining in this opening chapter? 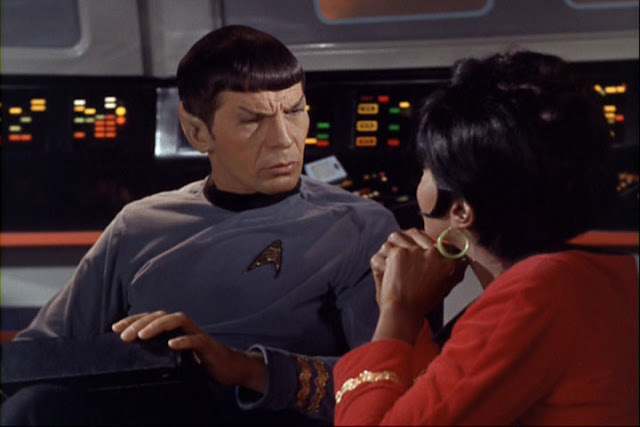 Just watch Spock nonplussed reaction to Uhuru's (Nichelle Nichols) flirtatious banter, it's priceless. And his insistence that he's immune to emotion when it's obvious he enjoys a friendship with Kirk, something Uhura even spells out - that's illogical! By day, an ordinary bloke in a dull 9 to 5. By night, a tired ordinary bloke. Martin still hasn't worked out what he wants to do when he grows up. He is currently 48.